The Irish Red and White Setter, unlike the Irish Setter, is still primarily a hunting dog, as it prefers to dress in tweed and can seldom be trained to use the right fork. The breed's table manners are atrocious and its discourse tends to the ribald, making it an unsuitable companion for town. 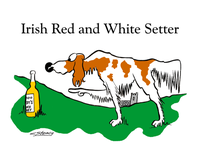 In the country, however, the Irish Red and White Setter can be a great and faithful friend if you can keep it out of the claret. The Irish Setter is a gorgeous red-haired dog that, like most gorgeous redheads, knows how good-looking it is, and acts accordingly. The Irish Setter was developed in Ireland in the 1700s as a gun dog, although few carry guns today and most are now poor shots. There's a related breed called the Red Setter that can still handle firearms, but evidently Irish Setter fanciers and Red Setter fanciers won't speak to, or of, each other. Both breeds are descended from the Irish Red and White Setter, which is predominantly white with red spots. The newer breeds were left out in the rain and have rusted completely. The Irish Setter is playful, loves to run, and the breed standard says it should have a "rollicking" temperament. In practice, this means the dog is likely to hide your socks and blame it on the cat, or hide the cat and blame it on your socks. Members of the breed have historically feigned a level of stupidity not usually seen in animate objects, but researchers have found that this is in fact a cover for a quite sophisticated rawhide-chewy-laundering scheme. Do not leave your wallet within reach of this dog.